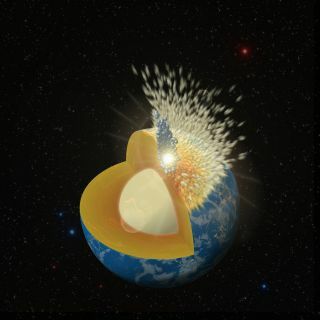 Early Earth was bombarded by material that plunged all the way to its core or splashed off, requiring the planet to take more hits to deposit some of the elements present in its mantle. Earth may have been bruised by the impact of more than one moon-size object early in its life. New simulations suggest that much of the material that crashed into our young planet may have been swallowed up by Earth's core or ricocheted back into space, requiring more collisions to leave the elemental signatures scientists see in the crust today. By measuring how much of these metals was mixed into the mantle, scientists estimated that about half a percent of the Earth's present mass came from colliding planetesimals. But these estimates assumed that the mantle held onto all of the highly siderophile elements. New simulations suggest that instead, some of the material might have been carried all the way into the core, where it would have mixed up or would have been thrown out of the system entirely. Both outcomes would have reduced the amount of metals that would have mixed into the mantle. That means Earth may have absorbed two to five times as many impacts as previously thought. This Southwest Research Institute animation depicts an object 3,000 kilometers (1,860 miles) wide crashing into the early Earth at 19 kilometers per second (12 miles per second). The right-side view shows the mixing of the object and Earth materials after the impact. "We modeled the massive collisions and how metals and silicates were integrated into Earth during this 'late accretion stage,' which lasted for hundreds of millions of years after the Moon formed," Simone Marchi, a researcher at the Southwest Research Institute (SwRI) in Colorado and lead author of a Nature Geoscience paper outlining these results, said in a statement. Marchi worked with Robin Canup, also at SwRI, and Richard Walker, a geologist at the University of Maryland.